So for decades the couple’s self-build dreams were held in abeyance, as they made little progress beyond enthusiastically reading property magazines. That all changed back in 2013, however, when they read an article in Build It. “We came across the Model D concept,” says Torq. 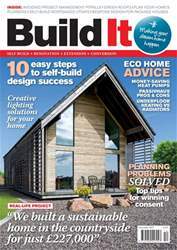 “This is an architect-designed kit house that’s both sustainable and aff ordable.” The project in question was a prototype owned by Bryan Stuart – who is also the owner of the building company that developed the idea. Bryan’s firm, Sylvan Stuart, specialises in timber frame structures. The company developed the Model D design with a view to creating an aff ordable house type that was made entirely from Scottish timber. “The name is a reference to Ford and how car types evolved from the basic to the luxurious,” says Bryan, who built the first Model D as his own home and to use as a show house for potential customers.